Waterproof and chemical boot protection. 11.5"h. 4 lbs., 5 oz. Wallow in mud, muck and mire. Your feet (and shoes inside) will be dry, clean and protected. After trekking sloppy terrain, just hose 'em off and set 'em outside to dry. No mess. No fuss. Sizes: S (6-8), M (8-10), L (10-11), XL (11-13) and 2XL (13-15). Weight: 4 lbs., 5 oz. 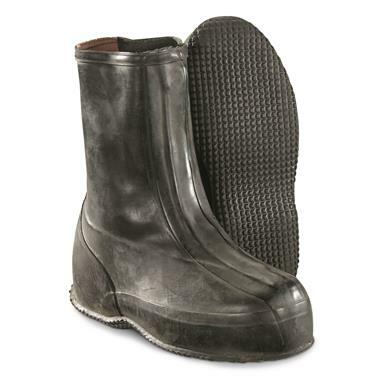 German Military Surplus Rubber Overboots, Like New is rated 5.0 out of 5 by 2. Rated 5 out of 5 by Hoohaw from High quality over shoes! Boughta pair for work, fit nicely over either boots, or tennis shoes.